We left our soggy campground early in the morning, after being warned by some of the campground dwellers that our route into Chicago might not be the safest as we would be biking through the suburbs Gary and Hammond...but it was kind of the only option so we shrugged off the warnings. It was definitely an interesting ride, we mainly took highway 12/20 along the coast of Lake Michigan. The road took us straight through the suburbs that we had been warned against, and it was quite clear that these areas were struggling with a lot of poverty...lots of boarded up houses, roads in disrepair etc., but people were nice - perhaps a little surprised to see two people with loaded bikes, but pretty friendly. In fact, as we biked into to the city of Chicago, we discovered that people we far less friendly in the city... I guess that it is an urban thing, but I played a game were I smiled and said hello to everyone that we passed and maybe about 5% of people even acknowledged us...it was pretty depressing... but we had made it to Chicago and we were elated and wouldn't let the grumpy Chicagoans ruin it! 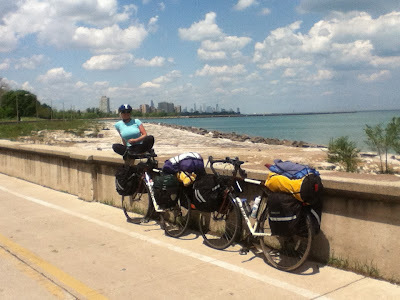 We were able to travel along an awesome waterfront trail for about 25 km of the ride before we turned into downtown Chicago, pedaled through Millennium Park (and were told to walk our bikes), and then to the north of the city to the hostel we were staying at. Chicago is actually a pretty incredible city to bike it, lots and lots of bike trails and pretty flat...it's just the wind that gets in the way. For anyone pondering it, the ride from Indiana Dunes to Chicago is definitely doable, even though the road is a little pot-hole infested, the traffic is really not that bad and the route is pretty straight forward. We spent a couple days walking and biking around Chicago. We took our bikes into a local shop to have them tuned up before we went to Alaska...in preparation for about 1500 km without a bike shop in sight. We visited the free zoo at Lincoln Park and found some other free activities in the city. On May 10 we left the hostel and explored the city a little on our loaded bikes. We visited a cool sculpture park, where Glenn made and installed a mobile! And we explored some of the trails in Chicago. At the end of the day we headed towards the airport and towards our Warm Showers hosts Matt and Jules. We stopped at a bike shop and picked up some bike boxes for the plane, and somehow managed to strap them to our bikes...it was pretty hilarious it looked like our bikes had wings! We had a great night at Jules and Matt's place - they were, once again, so so nice and hospitable...fed us some great food and had great conversation! The next morning Matt even rode to the airport with us, which was extremely helpful as we tackled the busy roads with our extra wide loads !